I cannot intro my “Read” pick without first mentioning Joni Mitchell. In my mind, there’s a spiritual kinship between the two. I’m not able to imagine the life of one without hearing the haunting melody or twisting canyon-ed words of the other. Reading Slouching Towards Bethlehem was my first time experiencing journalism beyond the ink-smudged pages of a newspaper. Didion’s writing startled and excited me. It was sharp and her tone in Slouching felt very specific to the 1960s. There was a brusqueness, or more so a matter-of-factness, to it that made me a little uneasy. Her essays transported me to places like Haight-Ashbury and introduced me to people such as Howard Hughes. Joan Didion wrote about what it was like to be young in New York and there I sat, young and in New York. I didn’t yet understand her feelings of a city growing old after living in it for eight years. I could not nor should I have understood it; it wasn’t my time to look back. My brain absorbed what I was reading, but couldn’t process it. Instead, I had enough foresight to store up words and dog ear pages for the moment my life and my experiences would one day catch up with these words. I reread Slouching in college, confident I had grown up and could fully appreciate all it had to offer. From there, I moved on to The White Album, Play It As It Lays, Salvador, Political Fictions, Vintage Didion, Where I Was From, and The Year of Magical Thinking. 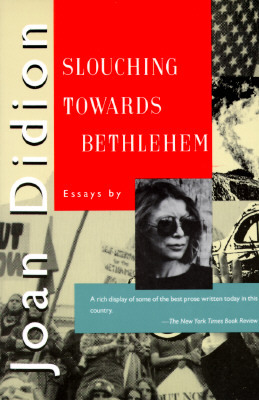 But reading Didion’s nonfiction is like adjusting your eyes to the darkness, at first you can’t see anything, then slowly, shapes start to form and objects recognized. Finally, you can see everything in the moonlight almost as clearly as you can in the day. I continue to reread these books every few years. As I do, more details become clear, there is more I understand and to which I relate. There are also more things that scare me and make me uneasy, because Didion tells the truth without the comforting veneer of metaphor. I suspect this is a pattern I will continue throughout my life. Rereading, understanding, relating. The very best books allow you to revisit them every few years and come away with new discoveries. An ongoing excavation. But with every reading, you still navigate those first chapters with your old map, tracing over surfaces, blowing away dust, until you begin the now familiar pattern of digging, deep and hard, into the ground; each time unearthing a new treasure to carry with you.